Let's get it out of the way right now, we've heard this story before. Two full years ago, a teardown of Google Camera v3.2 discussed the likely addition of RAW support, but it never materialized. Actually, on a technicality, that's not entirely true; an unofficial modified version by developer B-S-G was released with RAW support, last year. Well, we're back again with the same story, but this time things are looking slightly more concrete. When we looked at this the last time, RAW support was labeled 'experimental' and only had text for a single title and description. This time, there's still a setting, but no sign that it's experimental or intended just for developers. There is even "tutorial" text that explains RAW saves as a DNG file, suggests using a suitable photo editor that understands the format, and that shooting in raw will consume more storage space. It's possible the developers concluded it wasn't worth supporting RAW in the Google Camera app two years ago, or perhaps there were usability concerns associated with adding it–we've heard similar explanations like that regarding SD cards in the past. There's no denying that some users would turn on RAW, forget about it, and then get confused when they run out of space during the firework show at Disneyland. Virtually all smartphone cameras are designed with a fairly wide-angle lens. If you're shooting pictures of people and they're even reasonably close to the center, they'll look pretty normal. However, if you start framing your shot with people near the edges, the lens will distort them so it looks like they've had an encounter with a funhouse mirror. Google is adding a feature that can fix this effect. While photo editing software like Adobe Lightroom can correct for barrel distortion, the text in Google's Camera app is very specific about fixing distortion on faces. This leaves me wondering if the fixes are achieved through some seemingly magical algorithm like we've seen in Google Photos, or if it's sticking to the more conventional pixel-stretching approach we're used to. 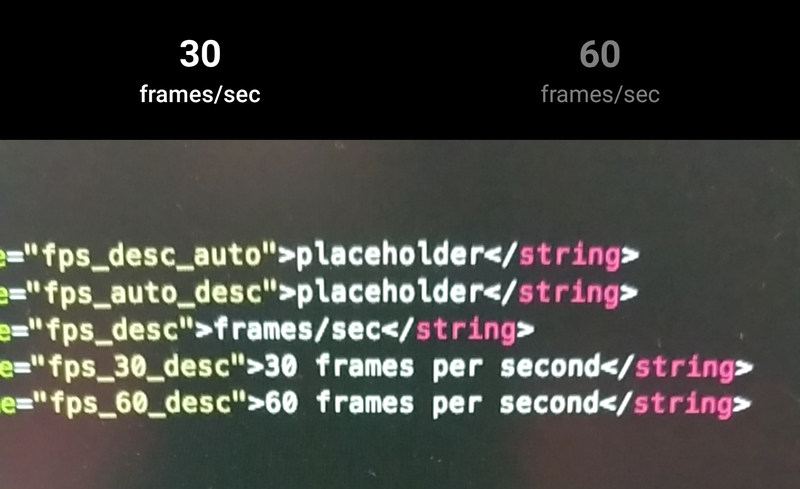 This is an interesting one, it looks like Google is adding an "auto" setting to its framerate selector for video. Right now, there are only two new lines with names that make it clear this is an automatic setting, but they contain "placeholder" text, so it seems this feature still isn't really named yet. Generally speaking, video framerates should be determined by the type of look you want from your video, or perhaps based on what you plan to do with the video after it is recorded. 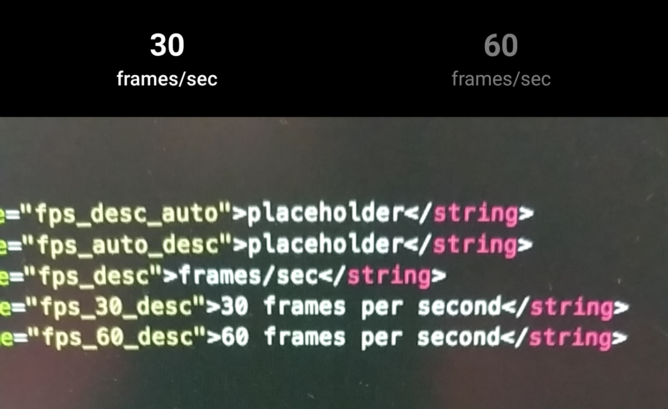 High framerates are useful if you plan to slow the footage down for greater impact, while slower framerates look more natural due to motion blur. Allowing the phone to make that decision could produce questionable results, but it might make sense for those without much photography knowledge. An automatic framerate might just allow the phone to pick a speed that will get the best exposure, especially in exceedingly bright or dark settings. Shiny new features... Surround sound "IMAX" audio? Who doesn't want some shiny new features? This is the question asked by a new set of strings. There's really no solid context from the text alone, it's just obvious that these are the lines shown to developers and testers when they have the option to turn on new shinies or stick with the boring defaults. The names of these lines gives a little more context, inferring that they have something to do with the microphone. However, it's the decompiled code that confirms this and adds more information. It appears that turning on the shiny features is actually code for controlling two modes: IMAX_AUDIO and MICROPHONE. In combination with some other clues, I get the sense that this feature will enable multi-channel audio recording when there is more than one microphone available. For those that don't know, many phones now include a second microphone, often for the purposes of noise cancelling while they're in speakerphone mode. It might not be very useful for many situations, but occasionally it can be helpful to have some sense of direction in videos, especially for sounds coming from off camera.